of their Birthless Lord in the form of a beautiful little blue boy; a form that was taken to enamor the whole world and warm everyone’s hearts with His wonderful lilas. At the Madhurapuri Ashram of HH Maharanyam Sri Sri Muralidhara Swamiji, Lord Krishna’s birth is celebrated with pomp and splendor with a grand 10-day Brahmotsav celebration that commences on Janmashtami day every year. The Madhurapuri Ashram, set in pristine, rustic surroundings, is situated in the Mahanyam village near Chennai, Tamil Nadu. The main hall of the ashram, Sri Bhagavata Bhavanam, houses the Divine Couple Sri Madhuri-Sakhi and Sri Premika Varadan Thakurji (Radha and Krishna). This hall reverberates with Mahamantra Kirtan between 6 AM and 6 PM everyday, all year round. The ashram also houses a beautiful Tulsi sanctum, go-shala (cow shed), a Veda patashala, a huge dining hall and kitchen, and a recently expanded building of guest rooms. Adjacent to the ashram are a lovely temple pond (teppam), a Kalyana Srinivasa Perumal temple and a 24-feet tall Sri Jaya Hanumanji, while opposite the ashram rises a beautiful, green hill, aptly named Madhurachalam. On the first day of the utsav the activities start in the evening with the recitation of the Bhagavata Mahatmyam as a prelude to the Srimad Bhagavata Saptaham to follow for the next seven days. 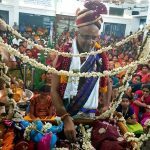 This is followed by a grand tirumanjanam to the Divine Couple by Sri Swamiji and Divya Namam where devotees sing bhajans while dancing around the Lord. At about 25 minutes to midnight, the verses pertaining to Lord Krishna’s birth from Srimad Bhagavatam are recited. 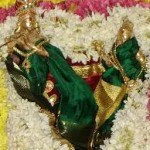 At midnight, a grand harathi is shown to Sri Premika Varadan and Sri Madhuri Sakhi, signifying the Lord’s birth. Then Nandotsav happens, where Sri Swamiji carries the little Krishna to the cradle, in the bhava of Nandababa. Bhagavatas and Gopikas dance around Lord Krishna in the cradle. Devotees splash curd, buttermilk and milk in celebration. From the next day on, Namasankirtan and bhajans reverberate through the Ashram all day long, and every morning and evening, the Divine Couple is taken on a procession in different vahanas like Garuda, Hamsa, Simha, Sesha, Elephant etc. surprisingly flat and guarded by a Venkatesa Perumal deity. Everyone ascends the hill bare-footed, and the Divine Couple arrive in their palanquin. 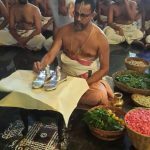 After tirumanjanam and a brief discourse on the glory of Govinda Pattabhishekam, the King of Kings is coronated with the supreme title ‘Govinda’. Basket-loads of different kinds of foods are offered to the Lord. Then Sri Swamiji drenches the Divine Couple with loads of 20 different varieties of flowers. On the 9th day, the entire ashram wears a different look, decked with huge arches, and numerous flower festoons crisscrossing the entire hall. It is the day of Radha-Kalyanam, the wedding of the Divine Couple. After the rendering of the Ashtapadi, Sri Swamiji unites the Couple in marriage—a wedding that one should have performed merits across a million years to witness, a wedding that would melt even the hardest of hearts in devotion. The marriage ceremony is followed by a sumptuous lunch prasad. In the evening, the teppam is scented with lotus and other fragrant flowers. Small oil lamps are lit on all the four sides of the pond. The Divine Couple then enjoys a boat ride on a flower-decked boat, as Bhagavatas sing beautiful kirtans. On the last day, the Divine Couple express their wish to ride on a chariot, and hence we have the Rathotsav. A tusker commences the Rathotsav by dragging the 15-feet tall silver chariot. Following this is the sad parting-ceremony, vidayaatri, when its time for visiting devotees to return. Although the above passages speak of the activities during the utsav, what sets Sri Swamiji’s Madhurapuri Brahmotsav apart are the indescribable beautiful bhavas and the divinity that prevails in the precincts of Madhurapuri over the 10 hallowed days. This year the utsav was held from Sep 1-10. Everyone is welcome to attend the yearly Brahmotsav celebrations. The next time you plan a visit to India in Aug-Sep, please do visit Madhurapuri and the Brahmotsav celebrations there. For more information about the Ashram or the Utsav, e-mail contact@godivinity.org.